Laelette the Vampire is a Breton vampire you will encounter during Laid to Rest. She is the wife of Thonnir and mother of Virkmund. She is said to have left her family to go join the Stormcloaks. Her son is determined to wait for her return, as it's all he talks about: "Have you seen my mother? I'm still waiting for her to come home. ", "Papa says that I shouldn't keep waiting. Why not? Mama has to come home some time. ", and "Who are the Stormcloaks, and why would mama want to spend time with them instead of me?" Her husband has several greetings on her as well: "My boy's to grow up without a mother? What life is that? It's not right, I tell you." and "Hasn't been seen for a while. She just vanished without a trace." However, after Jarl Idgrod sends you to inspect the burned down house during Laid to Rest, you'll find Helgi's Ghost who's willing to help you if you play hide and seek with her and "the other one". When you inquire further on this person, she'll only reveal: "I can't tell you. She might hear me. She's so close." When you enter the small graveyard and approach Helgi's coffin, you may hear Helgi's voice: "Make Laelette go away!" Laelette will come running up to you and immediately attack. Her stats and inventory are taken from the standard vampire stats. After you've dealt with her, Helgi's voice will explain what happened when you activate her coffin: "You found me! Laelette was trying to find me too, but I'm glad you found me first. Laelette was told to burn mommy and me, but she didn't want to. She wanted to play with me forever and ever. She kissed me on the neck, and I got so cold that the fire didn't even hurt. Laelette thought she could take me and keep me, but she can't. I'm all burned up." Should you approach Thonnir while you search for Helgi, he will say, "Have you seen Laelette? Have you seen my wife?" The moment Laelette is defeated, Thonnir will come running up to approach his wife's body and discover what she had become: "Laelette! She's dead! Ysmir's beard! She's...she's a vampire!" When you talk to Thonnir, you can ask him what he can tell you about his wife: "Laelette? I thought she left to join the Stormcloaks. Ah! My poor Laelette!" When you ask if he noticed anything strange before his wife left, he'll admit: "She began to spend a lot of time with Alva. Yet just a week before, she despised her. In fact, the night she disappeared, she was supposed to meet Alva. Alva told me later that she never showed up. I never got to tell her good bye." When you tell him they probably met after all, he'll ask: "You think Alva...but that means... Ye gods! You think Alva is a vampire?" Stating it's a possibility, he'll disagree: "No! You're wrong. You must be wrong. Laelette may have met her fate out in the marsh. I refuse to believe Alva had anything to do with this. There is no way you can prove it to the Jarl." From this point, he can greet you with: "She's dead. Laelette is dead. ", and "Some say the swamp took her. Part of me wishes it were that simple." Local innkeeper Jonna can be asked about Laelette at this point as well: "Now there's a mystery. She ran away when the war started. Her husband, Thonnir, was devastated. No note or nothin'. I'm pretty sure she up and joined the Stormcloaks." Alva will greet you with: "I hear you put Laelette out of her misery." 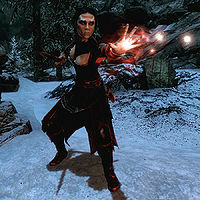 When you discover Alva's Journal, you'll learn that Alva turned Laelette into a vampire and kept her as her handmaiden. It was Alva that spread the rumor that Laelette had left to join the Stormcloaks, to cover for her disappearance. She told Laelette to kill Hroggar's family and make it look like an accident. To Alva's dismay, Laelette set fire to Hroggar's house with the family still alive. Laelette also tried to turn Helgi into a vampire, but killed the child and left the body to burn. The journal states Laelette became obsessed with the girl after the incident, thinking she could be brought back as a companion. During the quest, it's possible to encounter Laelette non-hostile up the slope from the graveyard near the rocks, invisible and unable to be harmed by melee attacks. 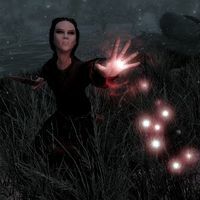 She will turn hostile when using spells and may turn visible, and can be killed. This does not change the course of the quest. This page was last modified on 15 November 2018, at 21:05.